NHAI Notification is out. NHAI is recruiting for 73 Manager And Accounts Officer Govt Job Posts. You can check NHAI - National Highway Authority of India last date, download NHAI notification, visit NHAI official website and check other NHAI Vacancy details.Complete Vacancy and recruitment Details about 73 Manager And Accounts Officer Govt Job vacancies in NHAI are provided below by JobSarkari.Com only for you. Last Date of Receipt Application Form. 27/05/2019. Manager ( Finance And Accounts). Candidate Must Have Passed Degree in Commerce/ Accounts or ICAI/ ICWAI/ MBA. Must be Member of organized Group- A in Finance/ Accounts And Having 4 Years Experience in Related Field. 41. Accounts Officer. Candidate Must Have Passed Degree in Commerce/ Accounts or ICAI/ ICWAI/ MBA. Must be Member of organized Group- A in Finance/ Accounts And Having 4 Years Experience in Related Field. 32. 3. Candidate Are Required to Fill all the Details in Application Form And Need to Attach All Mandatory Documents And Latest Passport Size Photo. 4. Candidate Have to Send the Application Form on Given Address on or Before 27th May 2019. Ajay Malik, DGM (HR&Admn. )-IB Plot No: G – 5&6, Sector – 10, Dwarka, New Delhi – 110075. Q. 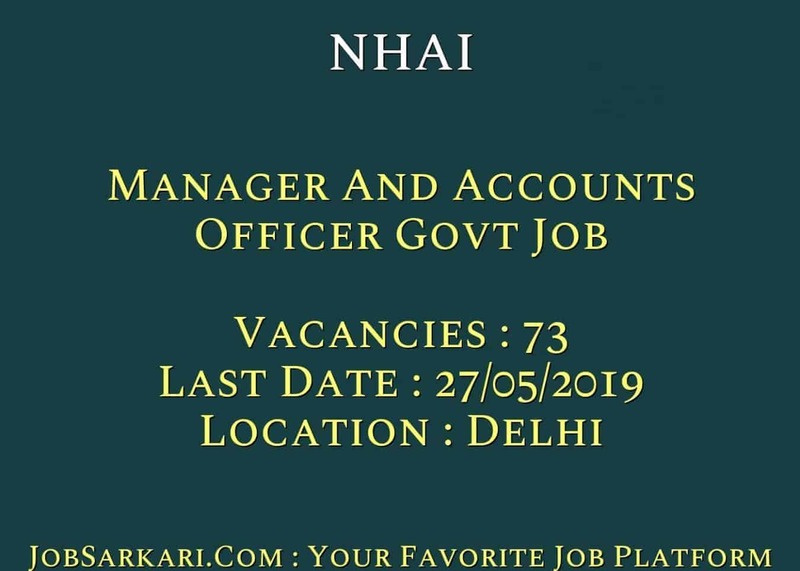 What is the Last Date For NHAI Manager And Accounts Officer Govt Job Vacancy ? A. 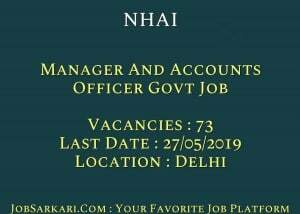 Last Date for NHAI Manager And Accounts Officer Govt Job Posts is 27/05/2019. Q. What is the Form Type of NHAI Manager And Accounts Officer Govt Job Recruitment ? A. The Form Type for NHAI Manager And Accounts Officer Govt Job Posts is Offline. Q. How many vacancies are available in National Highway Authority of India Manager And Accounts Officer Govt Job Posts ? A. There are about 70 Vacancies in National Highway Authority of India Manager And Accounts Officer Govt Job Posts.